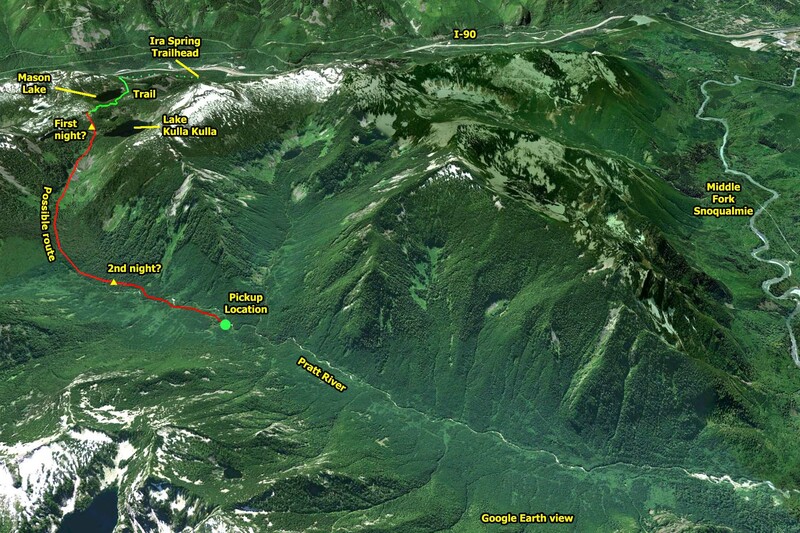 At about noon on July 26, 2013 a fire broke out on the lower elevations of Mount Si along 444th Ave SE. It was probably human-caused, and was named after after the road. Fire fighters had the advantage of using both the Boulder Garden loop and 444th Ave SE to get equipment in the fire area to control the blaze. The fire enveloped three prominent balds visible from the valley – Foundation Rock, BCD Vista and Moss Vista. The first two are rarely visited, but Moss Vista is the largest of the three and has a high overhanging wall with difficult rock climbing routes. The top of Moss Vista is also a popular Boulder Garden Loop side trip for picnics and views, at least for those who know it is there. It is marked on the Green Trails map but there are no signs along the maintained trails showing how to get to it. For the most part the fire burnt the understory and spared the crowns of most trees, so recovery should be relatively rapid. This entry was posted in Si and tagged DNR, fire, peakSi on 2013/07/26 by mvanderbilt. The closure of the lower couplet culvert has been delayed, and is now scheduled for August 5-30, 2013. 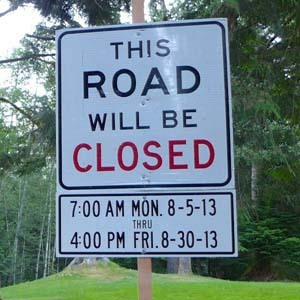 The delay may be related to miscoordination with the the asphalt patching work on the upper couplet road in early July. 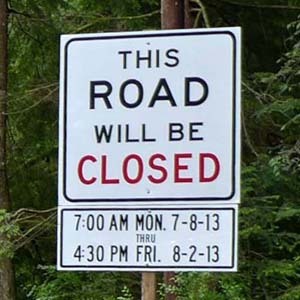 This entry was posted in Middle Fork Road and tagged king county, road on 2013/07/25 by mvanderbilt. On June 30, 2013 two teens, Brian Chim (19) and Ricardo Perez (18), started up the trail to Mason Lake on what was expected to be a hike and a swim on a hot day. Once arriving at the lake they decided to go further, and continued east-bound on the Mt Defiance trail (#1009) toward Rainbow Lake. 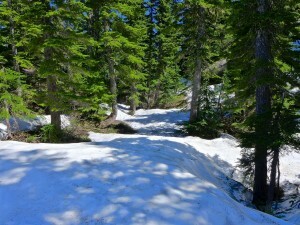 At the time, much of that trail was covered in snow. In an interview later they said “at some point we just lost the trail in the snow, and then in the creek bed, and then we thought it was a trail but then we continued down the creek bed and we just lost it”. Heading west to get back to Mason Lake, they ended up too far north and were drawn down into the upper reaches of the Pratt Valley near Lake Kulla Kulla, probably on or near the little-used trail below Sir Richard’s Pond (unofficial name). By 6pm they knew that they were lost when they came across a waterfall instead of the expected lake. The waterfall was probably the outlet of Lake Kulla Kulla. Brian, the more experienced of the two, felt confident that with warm summer weather they could build a fire and it would not be to bad to spend a night out. Ricardo was not so sanguine, saying “Brian kept me together. I was crying like a little girl. … Brian was there and talked me down.” They spent the first night in a “huge ravine” and the next morning had to descend a “phat cliff … we had to go from tree to tree and a couple times we had to traverse over rock faces with 40 foot drops.” During this period on July 1 they saw a helicopter looking for them, so they waited about 6 hours and when the helicopter did not return they headed down to the Pratt River and “took the river as far as we could go.” As the second night came they accepted that it might take longer to be found than expected, and it was difficult staying warm without long pants or a sweater. On the third day, July 2, they were spotted by a helicopter search team near the confluence of the Pratt and Spider Lake creek. Upon seeing the helicopter again, one of them shook a small tree to get the rescuer’s attention and they were hoisted into the helicopter and taken to Bandera airfield near I-90 exit 45. For spending two nights out they were doing relatively well, being just a little scratched up. Asked what they would do differently next time Ricardo immediately said “NOT HIKE!” To that non-list, Brian added a first aid kit, an emergency blanket, plenty of food, and “make sure the trail I’m going on is an actual trail”. 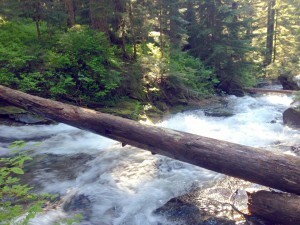 This entry was posted in Pratt River and tagged SAR on 2013/07/02 by mvanderbilt. 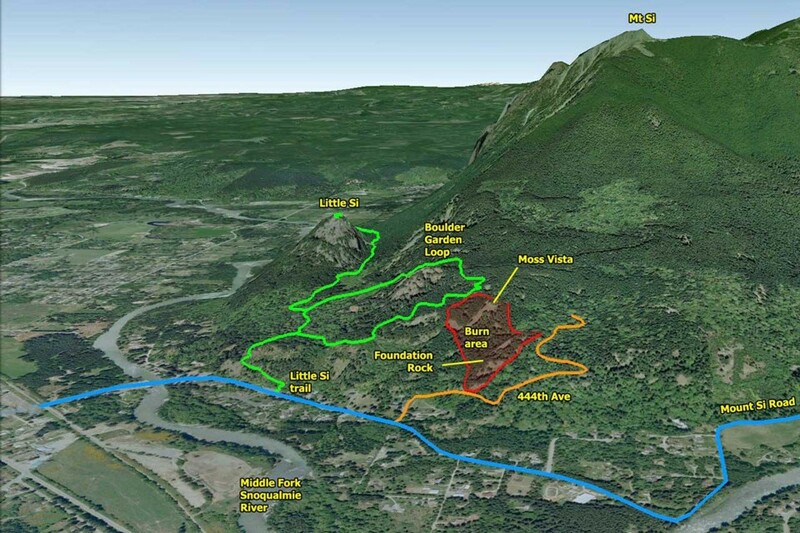 As of July 1, 2013 Mailbox Peak hikers can start using the new parking lot on weekends and holidays from 7am to dusk. Don’t know when dusk is? It will be posted on the gate so you will know ahead of time what time to be back to your car. The hours are limited to prevent late-night partying — city (North Bend), county (King) and state (DNR) budget crunches prevent frequent patrols of the parking lot. As at many easily accessible trailheads, vandalism continues to be a problem. Cars parked along the road experience regular breakins, most often the less busy days (Monday through Thursday) when the perpetrators are likely to be alone long enough to avoid detection. Never leave valuables in the car while hiking. This gallery captures a series of steps in the construction of the new parking lot. Enjoy the restrooms! More construction photos in this August 2012 post. This entry was posted in Mailbox and tagged DNR, parking, peakMailbox, toilet on 2013/07/01 by mvanderbilt.